Our little big planet has plenty of treasures to discover, from nature’s great spectacles to manmade wonders of all kinds. If you like to explore, Google Earth 7.1.1 is the search giant’s answer to your quest, with a detailed view of every corner of the globe, complete with a slew of 3-D models that simulate buildings in many cities across the world. As with Google’s browser-based offering, you can also explore neighborhoods using Street View, perform searches for businesses (and, perhaps a little more disturbingly, people), and identify points of interest with extreme ease. Unfortunately, the standalone desktop client is a very un-Mac-like app that doesn’t properly support OS X gestures like pinch to zoom, and comes with an undesirable baggage of other apps that you may not necessarily care about but have to download—and, in some case, install—anyway. 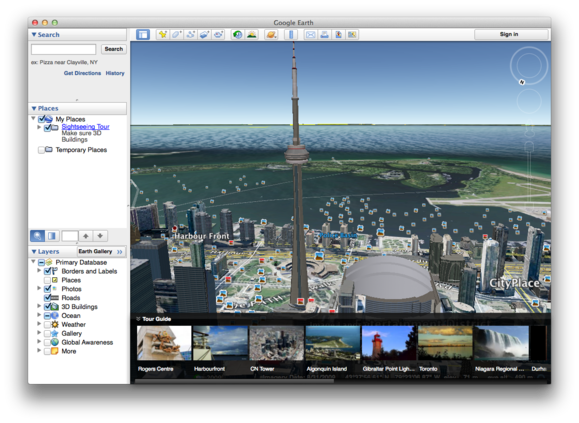 Though Google Earth doesn't have a Mac-friendly UI, the great detail in the maps make Google Earth fun.